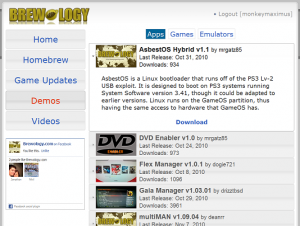 http://store.brewology.com allows you to download the latest Homebrew, Game Updates, Demos from your PS3 to install on your PS3. It also has videos that you can download or just watch in the page. To help further this project when you can’t find a game update please use the PS3 Homebrew Manager Java Applet as it will automatically add it to the store. If you find a PSN link you want to download that we don’t have please use the PSN Downloader and it will also be added to the store! Instructions: To use the store simply visit http://store.brewology.com in your PS3 Browser. When you find something you want make sure you have a USB storage device attached to your PS3. Click download and select the location to download to. Once back in the XMB you should be able to install the PKG without restarting the PS3. Hey, guys! We would love for you guys to follow us on your favorite RSS reader to stay up to date with the newest news! Especially regarding our amazing PS3 web applications!